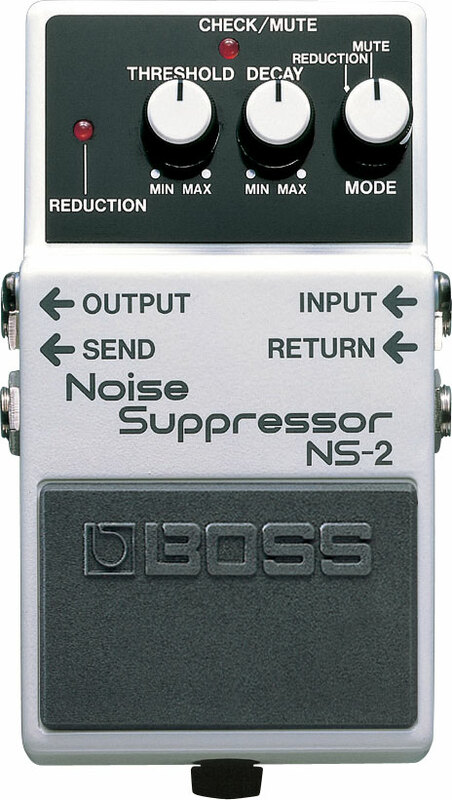 Analog Man carries the Boss NS-2 Noise Suppressor. The Boss NS2 produces a much more natural-sounding noise suppression with a smoother release than conventional noise gate units. The Boss NS2 produces a much more natural-sounding noise suppression with a smoother release than conventional noise gate units. A built in DC Out jack allows the NS2 to power other effect units when the NS2 itself is powered by a PSA120 adapter, by using the optional Daisy Chain. The NS-2 effectively eliminates noise and hum of the input signal while preserving the original sound's tonality. The natural attack and envelope are unaffected thanks to BOSS's unique noise detection circuit that precisely separates the guitar sound and the noise components.